I received a phone call from my friend again who told me that the moon is bright tonight with a fade shadow of Kinabalu Mountain. 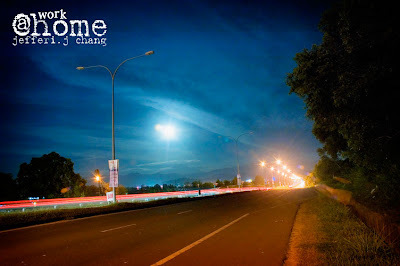 I quickly went to the Kepayan Sembulan Highway to take some shot of this scene. It turn out to be a very difficult shot as i don’t know where is the best location for me to put my camera and give it a good exposure at night. 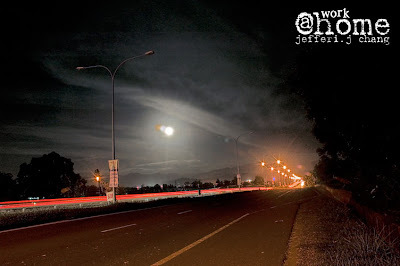 I realized that i made a bad mistake when taking a night shot at the side of a busy highway. 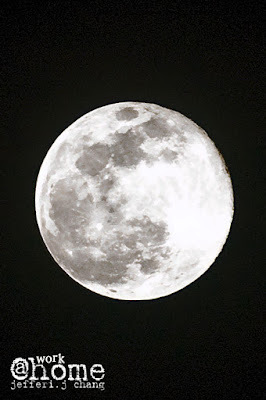 This was taken with 70-300mm zoom lens with a steady tripod. I jack up the ISO setting to 800 to avoid blur shake effect. My tripod is for video camera and not photo camera. I ended up made two version of photo shop touch up. The top photo was touch up fully with photo shop with high contrast to balance to moon and get rid of the blue sky and yellow streets light. It gives a feeling that one at the quite dark road side. I expose this shot to 10 second with slightly bigger aperture of f10. Longer exposure not good idea when lots of car passing by and it will spoil the photo. The second photo was touch up in two processes. First i fix the white balance and exposure in RAW camera menu and do the sharpen effect, bright and contrast effect and little change on the blue and yellow color. The streets look brighter on the second photos. I use the single lens and bigger the aperture to f1.8 and set the exposure to automatic about 1/15. It actually over expose and i tweak the highlight to make it darker in the RAW menu and the rest done with photo shop. 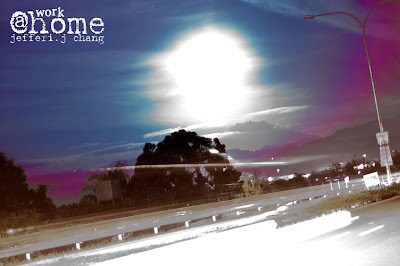 One can see the shadow of Kinabalu Mountain on the below of the over expose moon. I guess I need to set the exposure balance to max negative to compensate over burn highlight of the moon brightness. Basically this is a bad photo that heavily fixed with photo shop.